Literary elements at work in the story: Written in first person language that is accessible to young children, and illustrated in rich tones that breathe life into the holy dance of the Spirit, this book opens our understanding of how the liturgical year guides our worship. 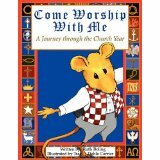 An adorable “church mouse” opens the book with the words, “Come with me” and invites us to join his family as they worship together throughout the church year. Along the way, he explains how each season connects to the biblical story of Jesus Christ and God’s marvelous act of love and salvation for all. This is a book that could be read as a whole story, but is most likely best used as a series of stories that walk through the church year focusing on the specific seasons, special days, and ordinary days that are celebrated. There are a few seasonal days missing from the book (the most noticeable is Christ the King Sunday) but they could be easily added by an educator or pastor if this book was being used as a series in a children’s worship education setting. The book concludes with five bonus pages of “Christian Symbols and Crosses” that have been used throughout the ages to express our faith. Beautiful illustrations, accompanied by the rich history of each symbol, make these pages a bonus treasure within the treasure of this book! Boling and Carrier have also provided us with two additional books, A Children’s Guide to Worship, and Mouse Tales-Things Hoped For: Advent, Christmas, and Epiphany using the same mice characters and language making this trio of books a must-have for every pastor, educator, and family! How does the perspective on gender/race/culture/economics/ability make a difference to the story? Since mice are the main characters of the book, gender and race distinctions portrayed in the book are minimal. However, there are certainly some distinctions made in the artwork that portrays fancy pews, formal church furnishings and well-dressed worshipers. The mice men wear suits, the mice women wear hats, and the pastors (male and female) wear robes along with the choir making it clear that these church mice worship in an affluent community. All the God language is gender neutral. Theological Conversation Partners: Christians around the world and throughout history have shaped their faith and marked their lives by the events of the church year, making this cycle as new as each new year of celebration. Why should we promote an understanding and appreciation of this ancient system? First – looking back – the liturgical church year connects us with Scripture through a planned series of readings, which present its great stories and themes, especially the life and words of our Lord. Second – looking ahead – the liturgical church year helps the Church, the community of believers, celebrate God’s forgiveness and justice for people today, living in an unforgiving and unjust world. Roughly speaking, the first half of the liturgical church year (Advent through Pentecost) recalls events in the life of our Lord, making them real for us in the present. The rest of the liturgical church year focuses on Jesus’ teachings and on discipleship – the new life in Christ in which we are living and growing. Teaching children about the ebb and flows of the liturgical church year invites them to connect the past with the present as a living testament of their faith. Each season has rituals and traditions that can also be played out in the home as a means to retell the Christian message. In this way, family rituals and traditions become household pulpits, natural and non-threatening ways to proclaim good news to the world and in the home. Does your church observe and celebrate the liturgical church year? How do you see the cycle played out? What is your favorite season in the liturgical church year? Why? What does your family do to celebrate this season? How can your family celebrate all the seasons of the liturgical church year at home? Do you have a family worship center at home for weekly or daily prayer time? Does your family have a church year calendar that could be displayed to help remind you of the season? The colors of the liturgical church year are purple (Advent, Lent), white (Christmas, Easter), red (Pentecost), and green (Ordinary Time). Look for these colors in your church and talk about how your family could use these colors in your home to celebrate the seasons of the liturgical church year. Brainstorm together on how your family can become a “household pulpit” that proclaims the Good News of Christ to the world. This review is written by regular reviewer Krista Lovell. Come Worship With Me by Storypath is licensed under a Creative Commons Attribution-NonCommercial 4.0 International License.